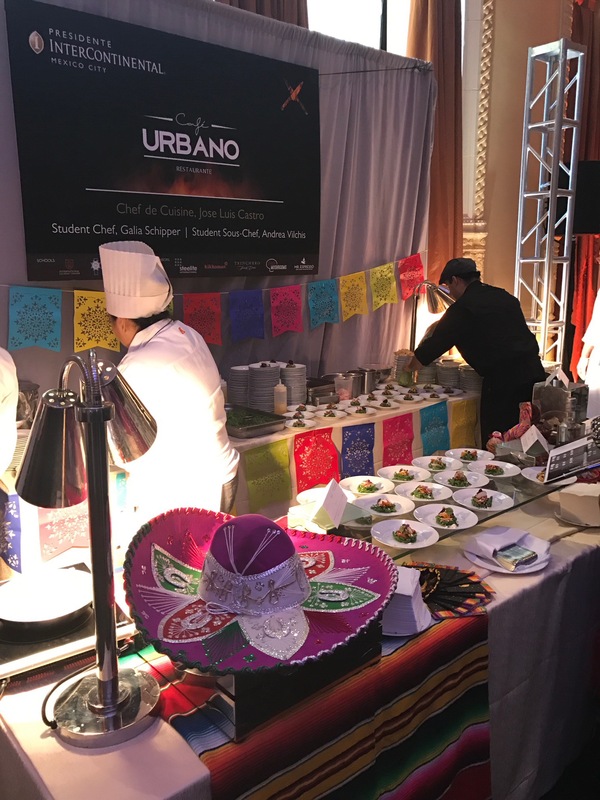 Cleveland culinary students valiantly took on San Francisco counterparts and competitors from as far away as Mexico City in this week’s Ultimate Culinary Clash at The Mark Hopkins Intercontinental Hotel in The Bay City. 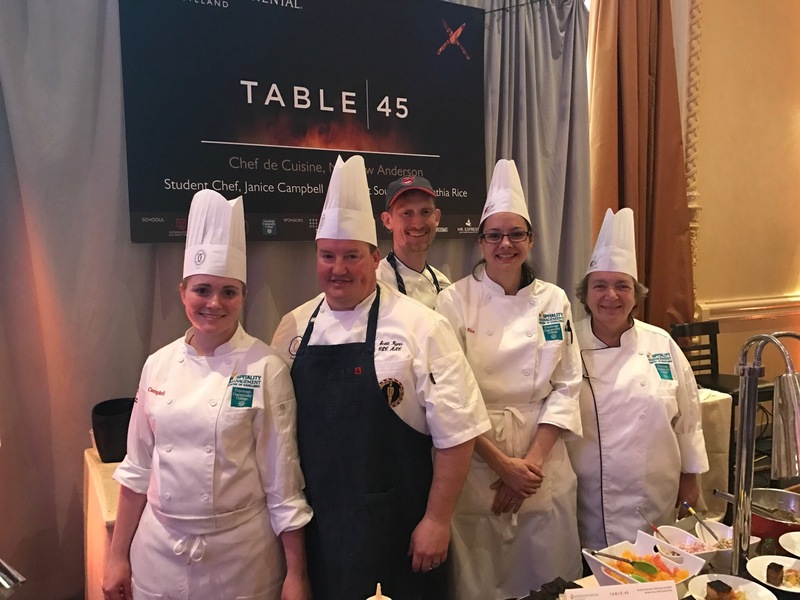 Following the regional competition at Table 45 inside the Intercontinental Hotel in Cleveland, the local team headed west to compete against culinary teams representing other Intercontinental properties. The stakes were high, $5,000 scholarship money to the team with the winning appetizer and entree combination. Luce, representing the Intercontinental Hotel in San Francisco. This crew presented a menu of Tostones with Soffrito, and Aji Amarillo. 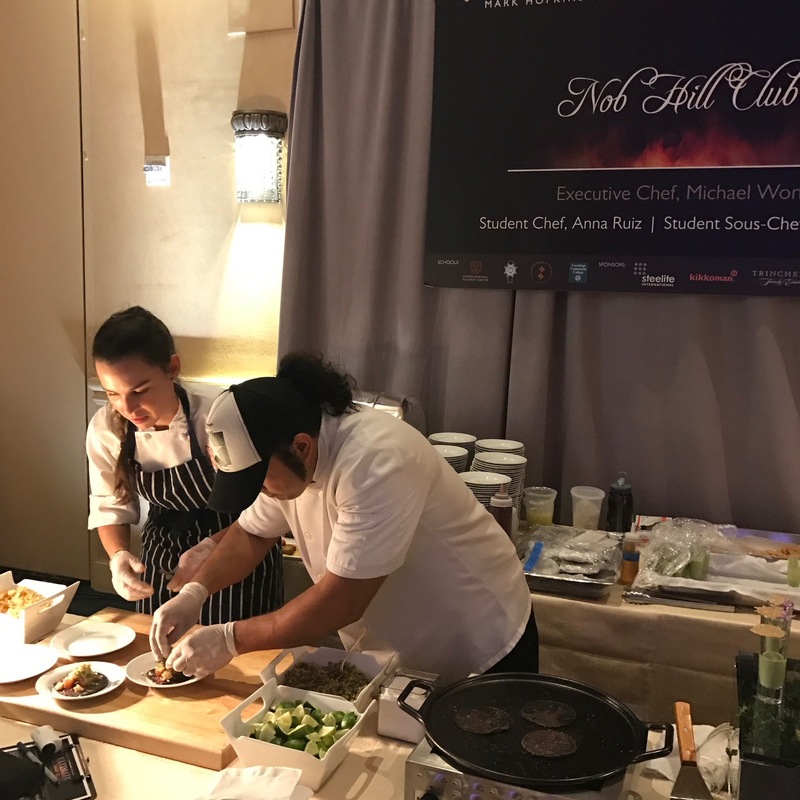 The Nob Hill Club, representing the Mark Hopkins Intercontinental Hotel, also in San Francisco, made Asparagus Veloutee and Glazed Pork Belly with Fennel Pollen Grits and Dandelion Greens. Cafe Urbano, representing the Intercontinental Hotel property in Mexico City, put out Drunk Salad and Tekuani Beef. 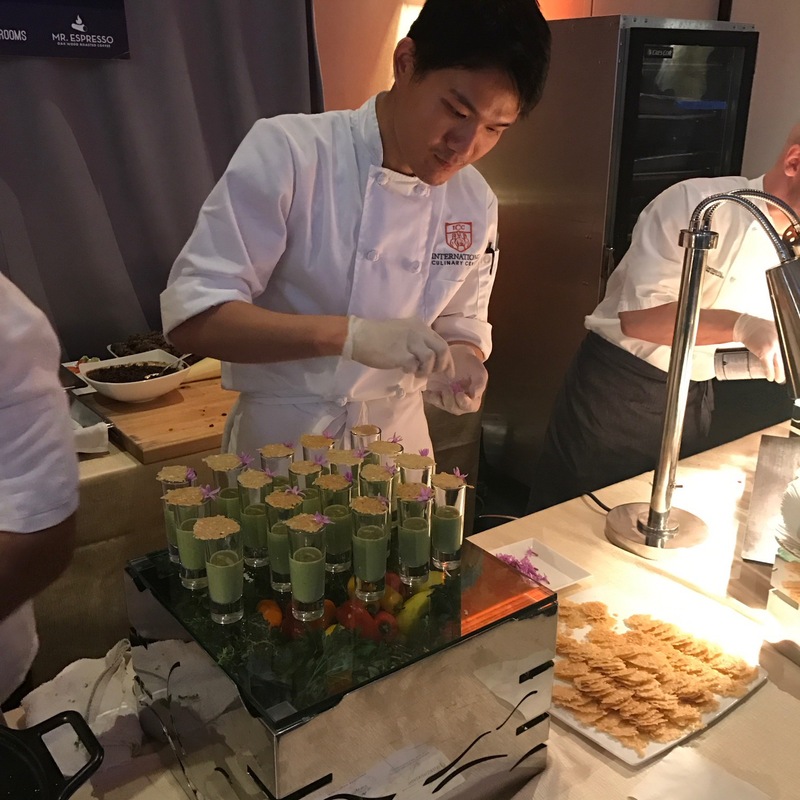 And my home town team from Table 45, the culinary team from the Intercontinental Hotel in Cleveland, presented an Aleppo Pepper Roasted Pork Belly and Miso Roasted Sable Fish. 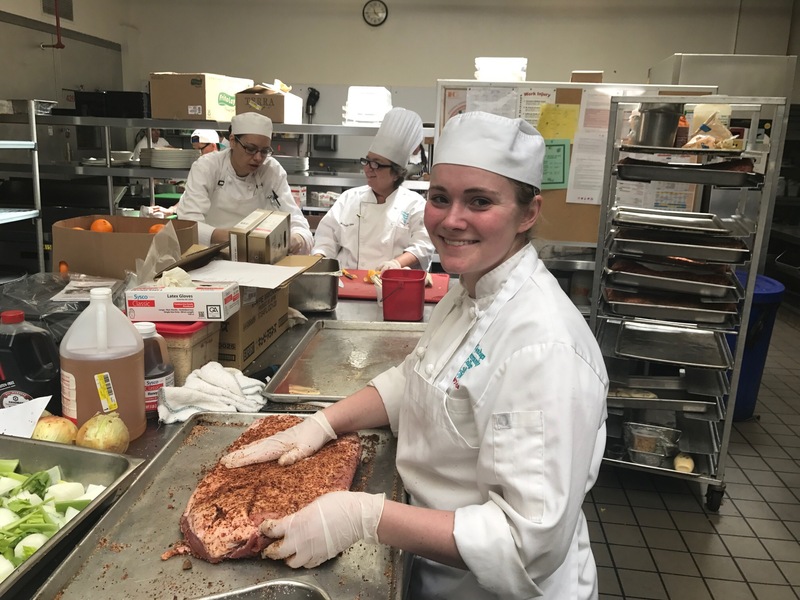 Janice Campbell, a culinary student at Tri-C, and her Sous Chef, Cynthia Rice, put together a menu that plenty of people at the event were talking about. They should be proud of their efforts! I served as a judge along with several San Francisco food authorities and a representative from Mexico City. Each station thoughtfully prepared their dishes for us, and the crowd, which was also asked to judge their plates (for taste, seasonality, presentation and creativity). In addition, the students were judged on their engagement with guests and their ability to present and sell their dishes. The students weren’t the only ones on the spot. 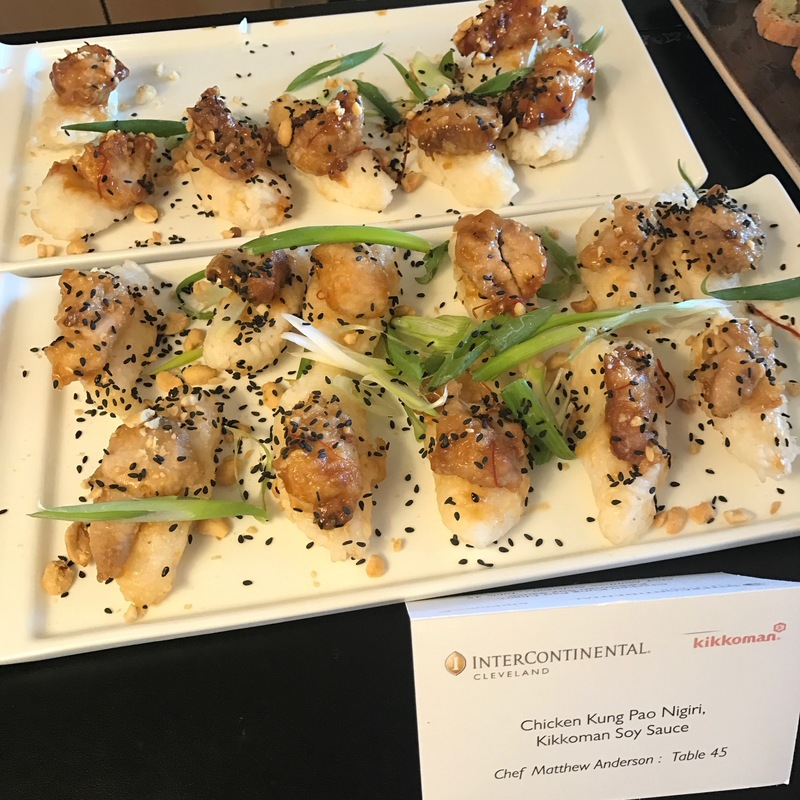 The executive chefs from the restaurants they represented were also challenged to put together passed appetizers incorporating sponsor product, Kikkoman. In addition, they had to develop a burger for the Beard Foundation’s Blended Burger Project. 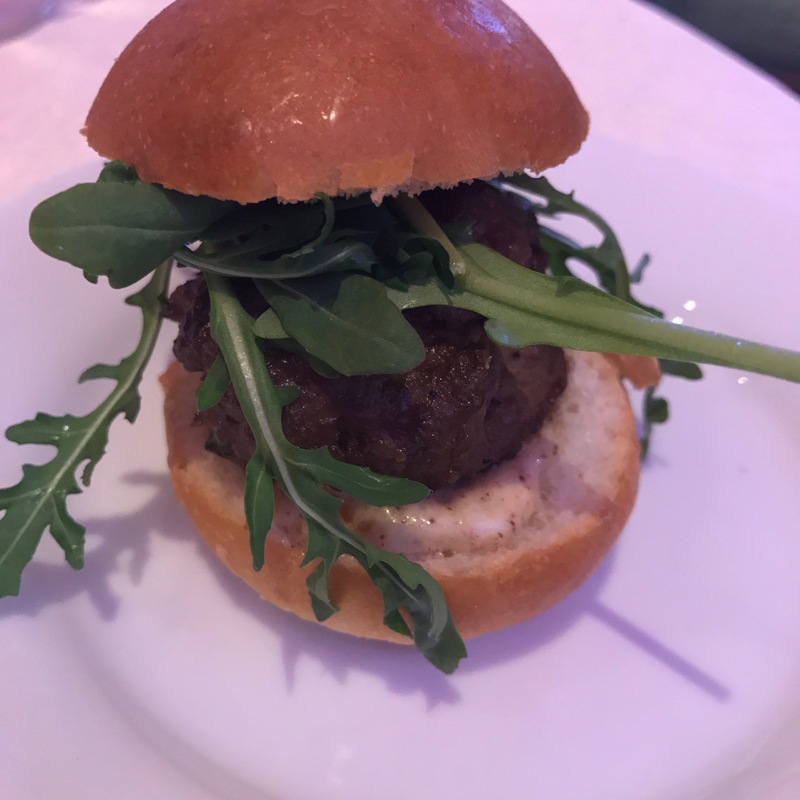 Each of those sliders had to contain 25% mushrooms, in an effort to curb meat consumption and foster more sustainability. Lots of eating and lots of judging. I was up for the task. The toughest category for me to judge was seasonality. I am not very familiar with what is in season in Mexico City or San Francisco. But I know good food when it hits my lips. 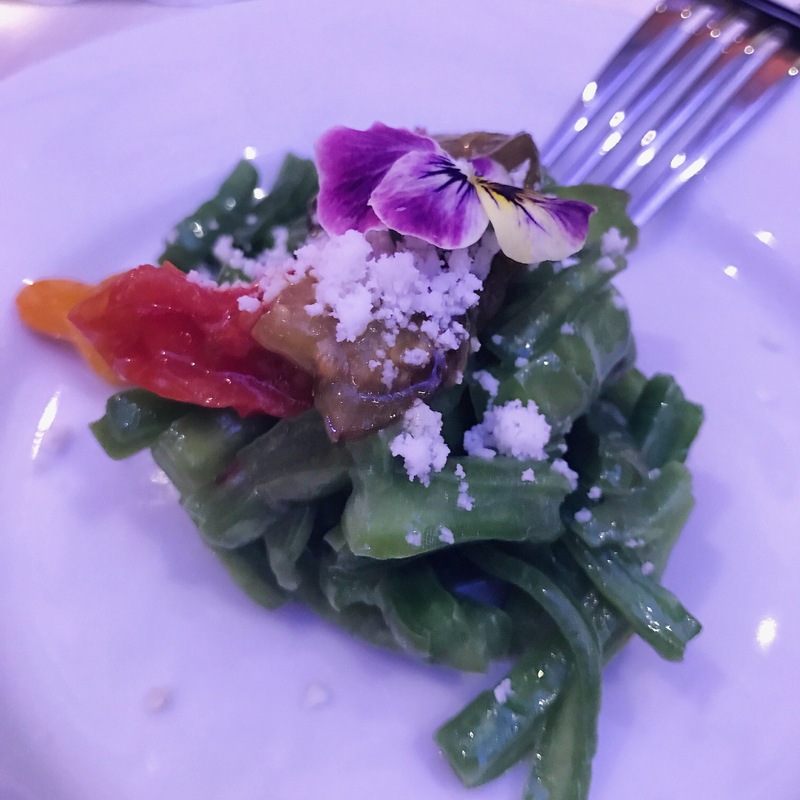 Among my favorites, were Student Chef Campbell’s marinated sable fish and the Cafe Urbano team’s drunk salad made with salt cured cactus leaf and a tequila vinaigrette. In the end, the team from Nob HIll was victorious, taking home bragging rights and the scholarship money. But the Cleveland team made food that had the room talking. This was surely excellent real world, working kitchen experience, alas well as excellent exposure for all involved. 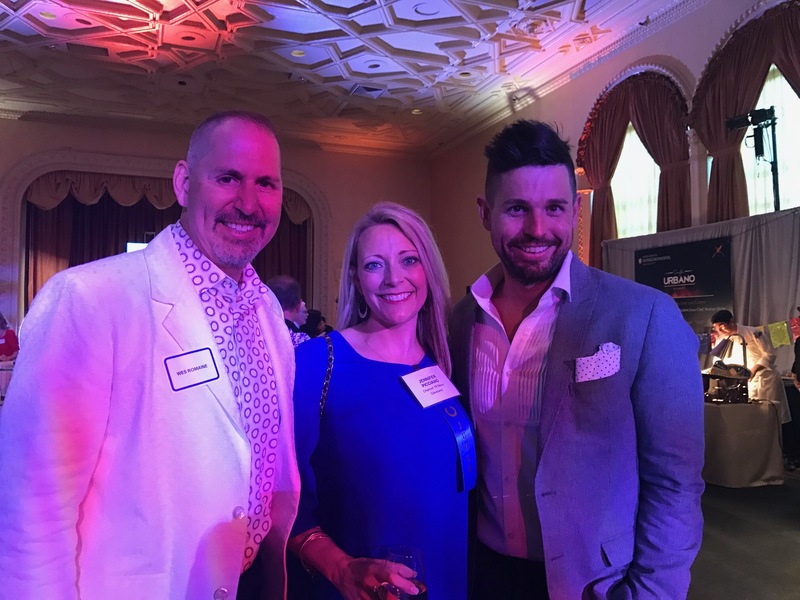 The culinary team from Table 45 showed the heavy hitters from the major culinary mecca that is San Francisco, just how great the food can be coming out of CLE. If you haven’t been to Table 45 lately, or ever, make a point to. It’s a global treat for the senses. Sophisticated and modern, Chef Zack Bruell calls it his favorite restaurant space, and that’s saying a lot. The man is starting to lose count of his establishments, there are so many! We were wined (with pairings for each plate) and dined (with a whopping 8 courses), and impressed with the knowledgeable and attentive staff. The sparkling evening started with a glass of Von Schleinitz Secco Sparkling Dry Reisling, and assorted sushi out on the tranquil patio. The restaurant is inside the InterContinental Hotel, a Cleveland Clinic property. The environment is a welcome reprieve from hectic pace kept around the rest of the mini-city that is The Clinic. The group moved into the fabulous chef’s table for the remainder of our meal. The set up provided us with a front row seat for all the meal preparation. And the chefs accompanied the wait staff to explain each course and answer questions. You know I had one. “How much does the international clientele and heart-healthy focus of the Cleveland Clinic play into the new menu?” The answer: quite a bit. Chef Anderson says Table 45 has always offered global cuisine, and still will. But he says they have also developed their dishes with capability of being “deconstructed” to accommodate various dietary restrictions, choices and allergies. So rather than limiting those who are cutting sodium, gluten free, dairy intolerant, etc. to just a few dishes, they are able to adjust most of the menu to please the patron. I appreciated the “choose your own adventure” approach to their offerings. The second course was a vegan Caesar salad, made with a creamy tofu vinaigrette, nori crumbles and fried tofu as croutons. Imagine my husband’s surprise that he actually enjoyed tofu. It was paired with a lovely Chilean wine, Mayu. For our third course, and one of my favorites, we were served a pan seared diver scallop with a chickpea puree (which ate like a slightly thicker hummus) and a raspberry glaze for the perfect acidic compliment. The Italian Conte Brandolini D’adda was a crisp partner to the dish. The fourth course featured a goat cheese gnocchi (instead of using potato) which I had never had before. What a scrumptious substitute. It was sauced with a tomato fondue, arugula, basil and balsamic reduction. My only complaint was I wish there was more of it! We were poured a Baumard Savenierres. Honestly, I can’t remember much about this wine. But I don’t remember disliking any of them! We continued our family style feast with a pan seared Chilean Seabass, always a favorite of mine. It sat on some smashed potatoes and a caper-tomato white wine broth which gave it a nice bite. The wine pairing here, another hit, Chanson Bourgogne Blanc. As if we had room for more…the heavier entrees were now coming out. This roasted chicken with a mole rojo and Spanish rice was a standout for me. Something I don’t ever cook myself, and rarely order, but really enjoyed. And the wine for this sixth course was the table favorite, a Chateau Musar Juene Rouge from Lebanon. Who knew Lebanon made such great wine?! The final savory course was my personal favorite, a grilled New York strip steak with a warm fingerling salad, wilted arugula, plenty of wild mushrooms and a port wine sauce. I am glad I paced myself up until this so I could have seconds! The wine was a velvety Rompicollo Sangiovese blend. Could’ve had three glasses of that. And for our eighth and final course, the chefs put out a simple spoonful that satisfied our collective sweet teeth: a classic crème brulee paired with a Marchesi Di Barolo Moscato. 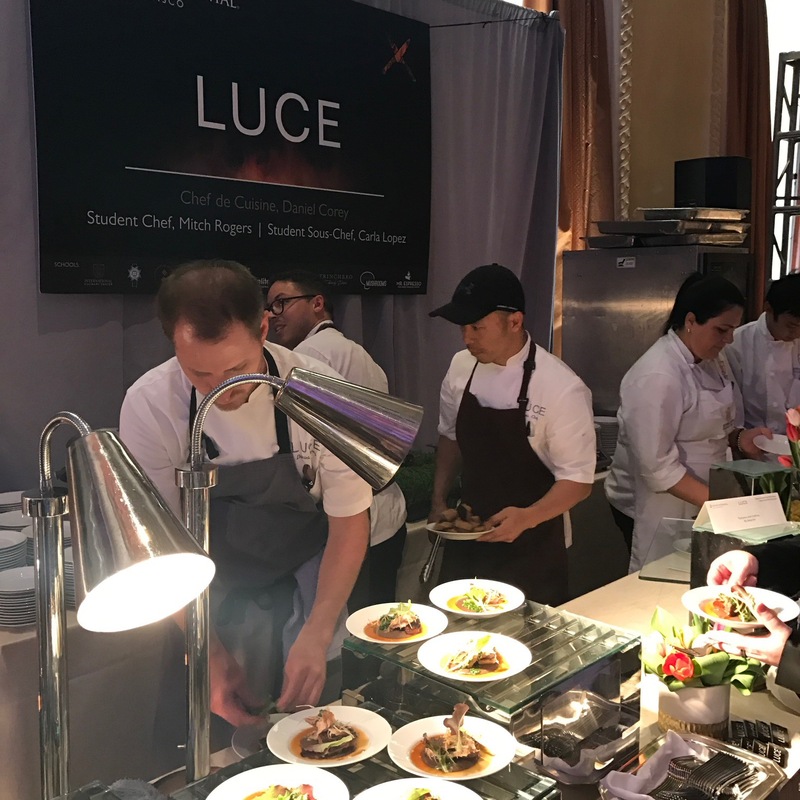 We were invited not only to share in this wonderful meal and see what these new chefs can do, but also to hear about this year’s Tour de Bruell. It’s the Amazing Race for Cleveland Foodies. The challenge is simple: eat at least one entrée at six of Chef Zack Bruell’s restaurants (Alley Cat, L’Albatros, Parallax, Chinato, Cowell & Hubbard and Table 45) between Memorial Day and Labor Day and get a card stamped at each stop. When your card is full, it’s entered into a hopper and the grand prize winner is treated to a lavish four course meal for 8 at your home, cooked by Chef Bruell himself. This year there are also some additional incentives and fun elements to the promotion. New this year: Finish the tour in the first 30 days and be entered to win a progressive dinner throughout several Zack Bruell’s Restaurants. Five lucky winners and their guests will be selected at random from submitted complete tickets to enjoy the chauffer-driven progressive dinner. And everyone who fills their ticket is invited to a complimentary VIP Party at Table 45 in September. they discuss The Calling at L’Albatros in University Circle. They will then move to Table 45 in the InterContinental Hotel, Parallax in Tremont and Alley Cat on the East Bank of the Flats. Each of these locations will feature complimentary tastings of several 90+ rated wines from The Calling. Reservations for the wine tasting can be made with the individual restaurants. I’ll be there! Will you? I also plan to start my journey on the Tour de Bruell by the first week in June. Better get dining!